Bulgaria has a well-developed cellular communications market, with GSM covering almost the entire territory of the country. A bad signal or its absence is observed only in high mountain locations. 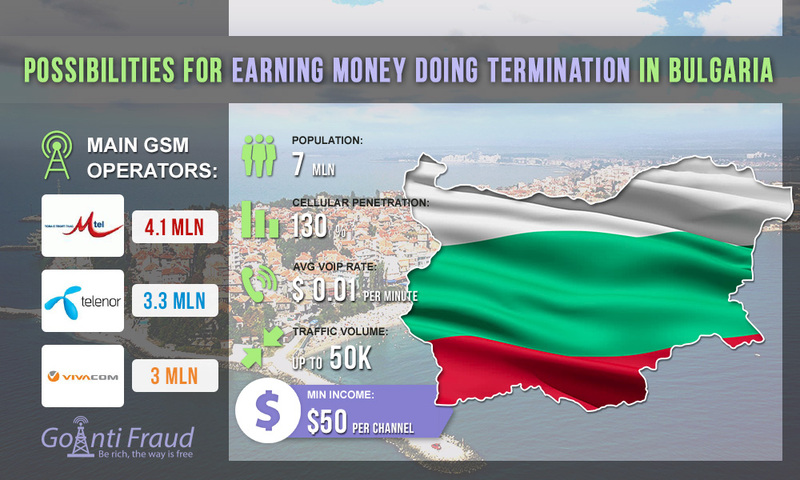 The penetration of mobile communication in Bulgaria is 130% (with a population of more than 7 million), and this figure is constantly growing. Despite the low rate ($0.01 per minute), it is quite possible to earn money by terminating VoIP traffic. There are also two providers offering only 4G connection services. They are Max Telecom and Bulsatcom. All three of the above national operators have a good GSM coverage (2G/3G), which covers more than 95% of the territory. SIM-cards on prepayment can be bought in branded salons of cellular companies, as well as in large supermarkets and from street vendors. The SIM-card costs over 4 dollars. There are also more profitable offers from Vivacom. You can buy its starter package for $7.4, with $ 5.7 immediately transferred to the account. For $3.4 you can buy a SIM-card, which provides 300 bonus minutes for domestic calls. With a proper approach to protecting numbers from being blocked by AntiFraud and choosing a profitable tariff plan, the terminator will be able to make over $50 from the channel. It is important to place dinstar dwg2000 or other VoIP equipment in large cities where large amounts of voice traffic are provided.